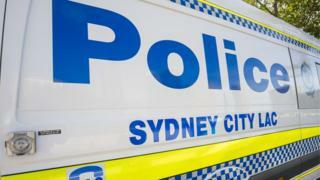 A three-year-old girl has died after suffering a gunshot wound to her neck while at home in Sydney, police say. Her father, 43, has been charged with offences including the unsafe storage of a weapon. Police have not said how the tragedy happened. Local media reported that officers are investigating whether the girl accidentally shot herself. The girl's three siblings, all aged under eight, and mother were in the house at the time, police said. Australian authorities would not say whether any of them witnessed the shooting at about 20:00 local time (10:00 GMT) on Sunday. A distressed woman, reported to be the girl's mother, was taken to an ambulance not long after the incident. She was heard saying: "Not my baby girl, not my baby girl." The girl's father lives at a separate address, said New South Wales Supt Paul Carrett. "The death of a three-year-old child under any circumstances is tragic," he said. "We would also like to take the opportunity to reiterate the need to keep firearms safe at all times." Local media reported that the weapon was a shotgun. The girl's father was charged with offences including not keeping a firearm safe, possessing a prohibited firearm, and possessing an unregistered prohibited firearm.